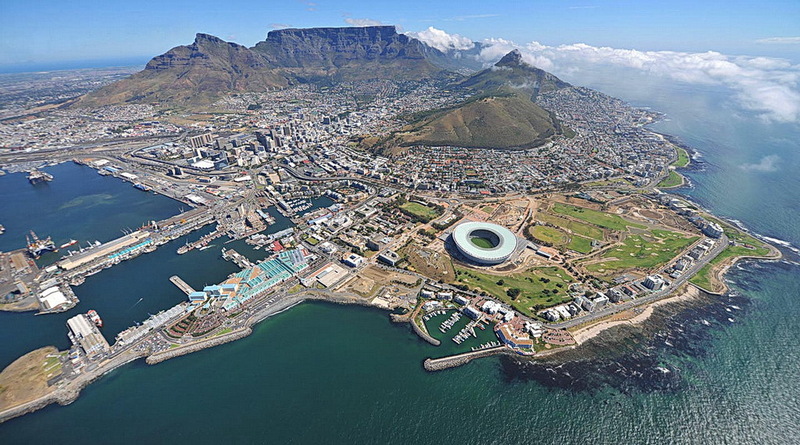 Drone view of Cape Town, South Africa. The port facility where we will load the vessel and depart for Heard Island is at left. Feb. 5, 2016. The container carrying the equipment for the expedition has arrived in Cape Town, South Africa, and has been put into storage awaiting arrival of the advance team March. 3. The vessel Braveheart will arrive March 5, while the full team will arrive March 7. We will sail for Heard Island March 10, weather permitting, of course! In addition, we are very appreciative of our South Africa team: Paul ZS1A, Pierre ZS1HF, Malcolm ZS6MAL, Sue ZS1AFR, and Tom ZS1AFS. Together with similar teams in California, Virginia, and Perth, Australia, the logistics is being managed professionally and securely.